Come on in and say hello or call us at (734) 451-0580. 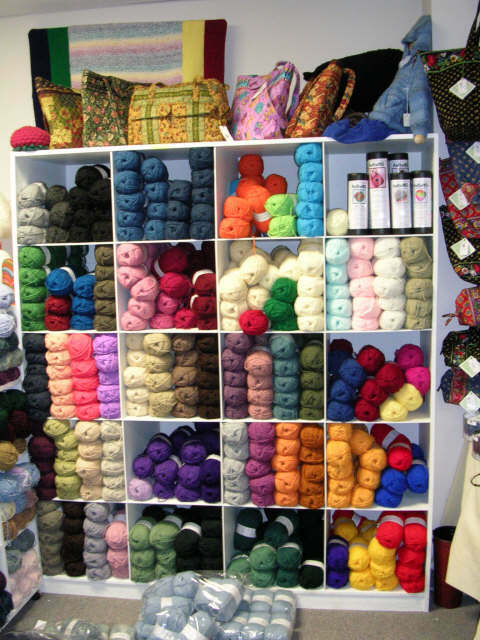 A sampling of our yarn supply. We have the best selection anywhere & we care about our customers! We also carry a great selection of needles and other accessories, patterns, books, and all kinds of bags. We have yarn for every project, from baby garments and afghans to glitzy scarves and felted bags – and everything in between. We are located in Plymouth Township on Ann Arbor Road between Lilley & Haggerty. We look forward to seeing you soon! When will the fall, 2013 class schedule be printed? Joanne – you can check out our site now – (oldvillageyarnshop.com), I just posted the 2013 class schedule. Thank you for your interest. Do you have any Debbie Bliss pure cashmere yarn? Hi Candice–We do indeed have Debbie Bliss pure cashmere. We have quite a few colors!